The origins of Alicante wines are told in the legends and fables surrounding the historic roots of wine in every region. In our province the Iberians were the first to grow vines for domestic use, although the plants already grew wild. It was probably the Phoenicians who first started cultivating vines in the first half of the first millennium BC. The Romans were keen vine growers. Archaeological remains, especially in the Marquesado area, have uncovered wine amphorae and large “Villae” or vineyard estates, and even the remains of a factory where wine amphorae were made. There are vague records of our wines in the late Middle Ages and it appears that vines and wine production went into sharp decline, like so many other things, during this era. 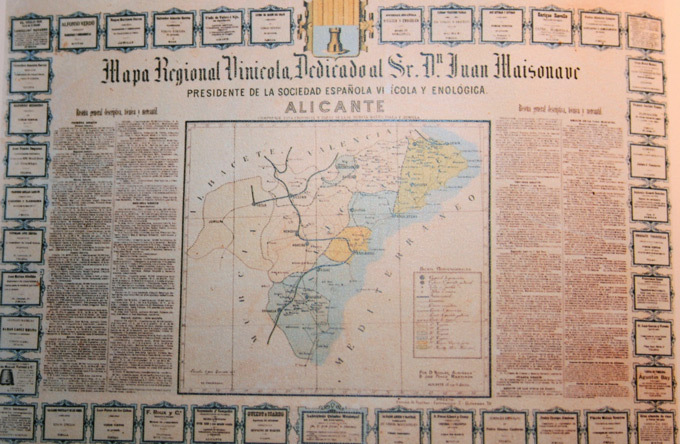 Curiously, the first written records came from Arab poets whose verses praised the excellent qualities of wine, and the “Llibre de Repartiment” (a document recording distribution of properties after the conquest of Valencia in 1238) contains sections in which vineyards are granted in various towns and villages across the province. But it was only from the 15th century onwards that our wines really began to be documented. The archaeological site of Benimaqua in Denia has one of the oldest wine presses in Europe. 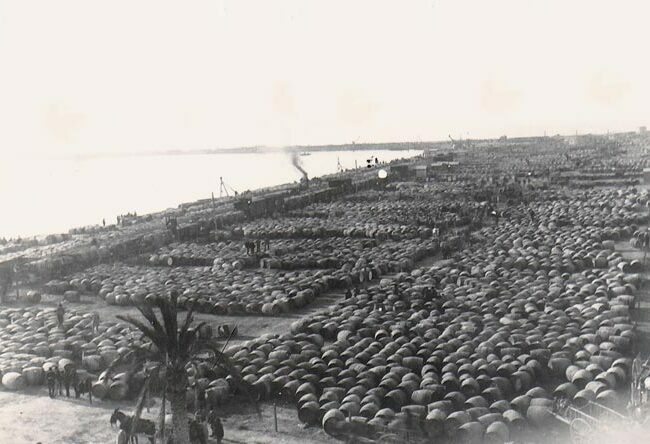 Its location right next to the sea suggests that wine was shipped abroad from here, a common practice throughout the history of the Wines of Alicante PDO. In 1510, King Ferdinand the Catholic banned the sale of wines from other regions in Alicante. In 1596, King Philip II confirm this privilege: “La Collita de Vi sia la Mes principal de la qual se sustenta molta gent així principal com plebeyos” (The wine harvest is the main month in which both rich and poor make their living). All these privileges were aimed at protecting locally produced wine, as their fame had travelled far beyond our borders, as recorded by Jerónimo Múnzer in his book “Itinerarium sive prereginatio per Hispaniam …” published in 1492. He writes, “in the eastern part of this land they make a lot of white wine, but even more of the type known as Alicante red, which is very popular in England, Scotland, Flanders and other places in Europe… on the day we spent in the city we saw 26 vessels in the port from Biscay, Flanders and other countries loading their cargoes of wine”. During the 17th and 18th centuries production of Alicante wine continued to rise, but only wine produced in the region could be exported from the port of Alicante. Vineyards in Orihuela, Jijona, Monforte and Novelda were at peak production. The monopoly of 1510 came to an end in 1756 when permission was granted for exporting wines from the interior areas of the province, albeit with certain restrictions. It was not until 25 February 1834 that wine trade was liberalised throughout the province. 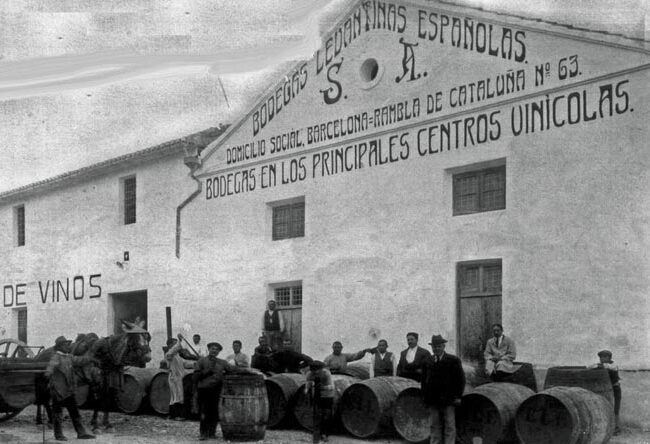 However, the 19th century was to be the Golden Age of wine production in Alicante. In this century practically every village had land given over to vine growing and Spain’s first wine centre was set up in Cocentaina to work on trying to stop the spread of grape Phylloxera to these areas. Our wines have also had a “Royal Designation” and were drunk by cardinals in the Renaissance, kings and queens of France and the literary elite. We have some valuable and fascinating eye-witness accounts of how famous our wines became. Let’s take a look at some of them: In his memoirs, the Duke of Saint Simón tells how when the Sun King, Louis XIV of France, was at death’s door, consumed by gangrene, the only food he could stomach was sponge cake soaked in Alicante wine. In his work Le mal hereditaire, Doctor Cabanes refers to Elisabeth Farnese, Queen Consort of Philip V of Spain “making her royal husband follow a diet of spices and meat stews and Alicante wine, which had him in a constant state of enervation, under the command of her caresses or denials, using ingredients that ignite passion at the expense of life”. It has also been the wine of choice for famous sailors and admirals. 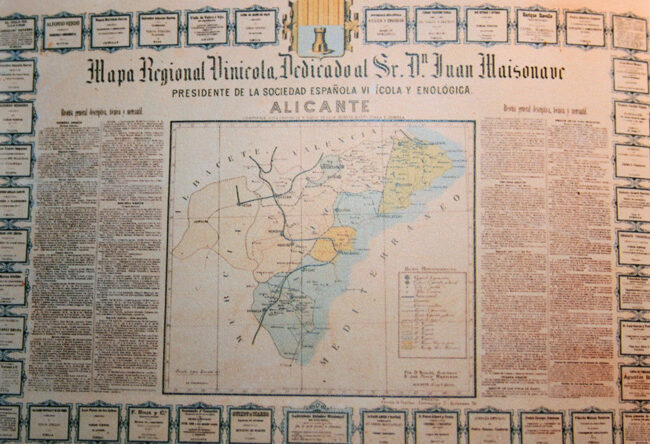 Admiral Julio Guillen Tato wrote that wine from Alicante was the first to go all the way around the world, as it accompanied Elcano on his second voyage around the globe. There is no proof of this, but it is quite nice to think that the promise made by Elcano to the Veil of Veronica was in gratitude for the wine, which was produced nearby and which helped him on his journey. These wines are also part of literary history: Dernboswxki, Dumas, Salgari, Davillier, Quinet and many others have mentioned them in their books and enjoyed drinking them. Authors like Alexandre Dumas, who in chapter 65 of The Count of Montecristo tells of the Count’s visit to Major Cavalcanti, who asks him to choose between Sherry, Port and Alicante Wine. The Count chooses an Alicante, which also happens to be the Major’s favourite, thus sealing his approval of Montecristo’s choice. As we have already said, the Golden Age of Alicante Wine started in the 19th century. Halfway through this century, first Oidium and then Phylloxera devastated French vineyards. A preferential trade agreement was signed with France, securing a brilliant future for our wines. At the close of the century we had 93,000 hectares of vineyards producing more than 1,200,000 hectolitres of wine. At present we have no more than 10,000 hectares producing around 400,000 hectolitres. 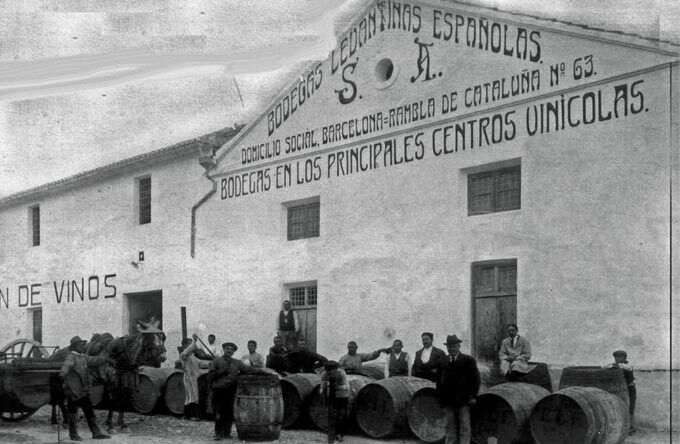 The French agreement came to an end in 1892 and excessive production began to have severe adverse effects on Alicante’s wine production. During this period, people used to say that “if the agreement with France had lasted another ten years, the magnificent Paseo de la Explanada could have been paved with gold coins”. The great Spanish author Azorín, in chapter 6 of the second part of La Voluntad (Volition, 1902) referred to the tragic consequences of the breakdown of the trade agreement with France. Lastly, our history would not be complete without mentioning the famous Fondillón, an Alicante wine that has featured on the world’s best tables throughout its history. The only surviving records show that the Monastrell grape variety was the main ingredient for this wine. In 1796, Cabanilles wrote in his famous book “the leaves of the Monastrell vine are dark green and those of Parrell are whiteish underneath; there are more grapes to a bunch on Parrell vines and they are tightly bunched together than Monastrell, and that is why some pickers adulterate the wine known as Alicante by mixing them together, as they are similar in colour. True Alicante wine must be made using Monastrell grapes, giving rise to this thick, sweet-flavoured and slightly rough wine, so appreciated in all nations”. As part of the process to obtain this wine, in Alicante’s inland and coastal vineyards the bunches were cleaned and left out in the sun. In the interior, most Fondillón was obtained from grapes that had been exposed to the sun on the vine and picked some while after the main harvest season. After crushing the must with its skin intact was placed in oak barrels to ferment for a month. The amount of sugar produced with this system easily produced wine with up to 18o of alcohol content and this was then transferred to Solera ageing barrels. The Maisonnave wine catalogue from the end of the last century contains these sale prices: Alicante Fondillón wine 800 francs/hectolitre, Malaga 135, Port, 153, Sherry 204, Valdepeñas 60. These prices alone show how prestigious Fondillón came to be. 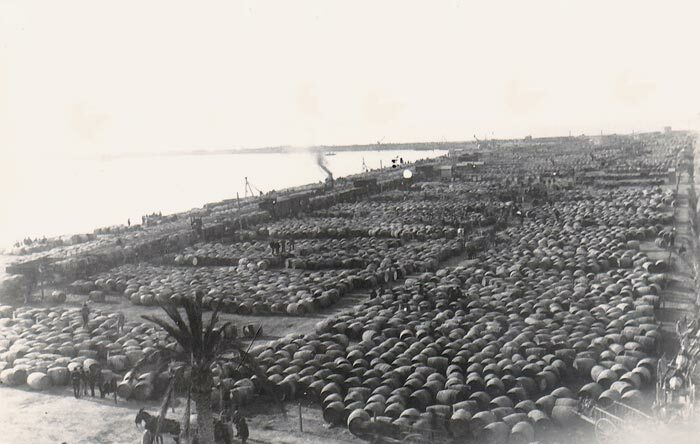 The 20th century saw a slowdown in wine growing as the productive and economic model in the province of Alicante underwent change in favour of tourism and industry, as well as other more profitable crops more suited to current trends. However, the whole history of the Wines of Alicante PDO was consolidated with the creation of the “Alicante Designation of Origin” in 1932 and the constitution of its first Regulatory Board in 1957. These years were spent in trying to organise the sector, uniting production, providing incentives for improving quality and bottling procedures, changing production methods and formats to satisfy modern consumers. All these changes came to fruition in the 1990s when new wineries started appearing on the scene, adding innovative approaches to traditional winemaking and giving the Wines of Alicante PDO a new lease of life. Today’s wine industry is being built on new facilities, new wines, young oenologists and growers, awards, prizes and a greater awareness of our wine producing culture.